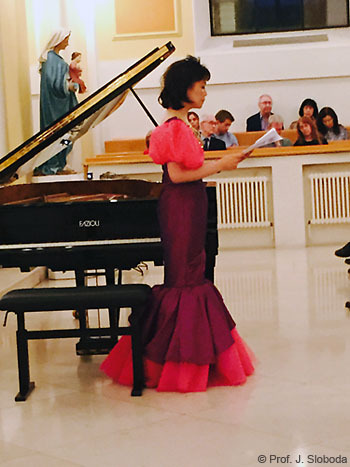 On the 9th of April 2015, in London, Noriko Ogawa gave a piano recital to launch her Ambassadorship as Cultural Ambassador of National Autistic Society (NAS), UK. She also delivered a speech which is available to read below. Upcoming Jamie’s Concerts in the UK will take place on 22 April at Bridgewater Hall, Manchester and on 5 May at Milton Court Concert Hall (Guildhall School of Music & Drama), London. 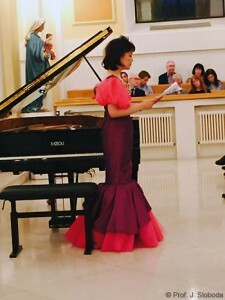 Noriko giving the speech at Eaton Square Concert. Ladies and Gentlemen, distinguished guests, it is a great pleasure for me to play for you all this evening and I would like to take a few moments to tell you what this recital means to me. 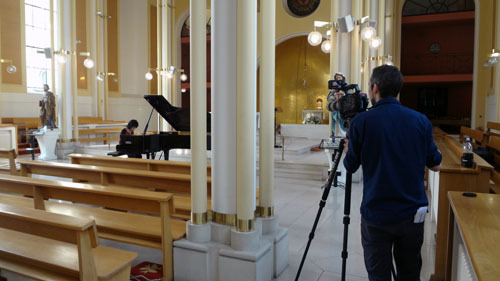 When I first started my career as a concert pianist I lodged at the North London home of professional musicians, Peter and Janice, and their daughter Sophie. One day Janice told me she was expecting a second child, and in due course a beautiful baby boy called Jamie was born. I remember taking telephone messages of congratulations for the happy parents on a bright, sunny day. The most noticeable thing about this stunning looking boy was his beautiful blue eyes, but when Jamie was a year and half old I noticed something which worried me. Those beautiful blue eyes were not looking at anything. I went to Peter and Janice to voice my concern, ‘I think Jamie is autistic’ I said, ‘Please take him to the doctor’. Two pairs of eyes stared at me as Peter and Janice said, ‘We have every reason to say no to you’. A few months later, Jamie was diagnosed as severely autistic. I was fascinated by Jamie’s unique personality and his fussiness over tiny details. He had a captivating way about him which drew me in at every turn. My desire to help him grew and grew, but I quickly discovered it was the last thing he wanted. For Jamie, eye contact has always been painful and he does not use verbal communication. But that did not prevent him from making one thing very clear, he knew I was a stranger in the house. Even today Janice and I often laugh as we recall how he treated me in those days but I value Jamie’s authenticity in dealing with me – his ‘rejection’ of me is his intrinsic honesty – he does not know how to lie. Jamie is clearly an English boy, he loves his fish fingers, baked beans, and mashed potatoes and the young Jamie turned his nose up to anything cooked by the Japanese lodger. After 20 years this has not changed in the slightest: Teriyaki Chicken and rice remains the dinner from hell for him! Jamie was a proud boy, and while his sister Sophie had to learn to compromise when I helped care for them, he firmly refused to cooperate. Jamie didn’t need much sleep. He would run around his room screaming, sweeping books off shelves in the night. Janice and I would sit up in his bedroom sipping tea until his distress abated and he calmed down. I noticed a pattern over time: the more Janice was distressed, the more challenging Jamie’s behaviour became – a calmer Janice meant a calmer Jamie. The seeds of an idea were planted in my mind. I wanted to help Jamie, but he refused my help because I was an outsider. I am not a doctor, a nurse, or a teacher with special skills. I am only a pianist. But I know their life and what they go through, I know the routines, the day to day life of Jamie and his family, and of families like theirs. Once the idea of Jamie’s Concerts came to mind it took me no time at all to come up with the fundamental concept. The Concerts are designed to provide a relaxing musical occasion and one that fits in with the busy and hectic timetables of parents and carers. Concerts take place on weekdays during the school term. Doors open at 10.30a.m. and concerts commence at 11.00a.m. Autism is an invisible disability. You cannot see it unless you have some knowledge and understanding and certain things have to be carefully and discreetly planned. Concerts should be professional and be staged at top class venues with no compromise in programmes. Musicians should dress in their finery and give their best performances. The standards and quality of the concerts and the venues must be the same as for any other concert. Children with autism are very welcome at the concerts but I leave it to the carers to decide whether they bring them along. Jamie comes from a very musical family and both his parents. His sister Sophie, and his aunties are professional musicians. Like many other people with autism Jamie has a sensory problem with sound and light – he is so sensitive to musical sound or bright lights that to attend a concert is impossible for him. To add to this, he has made it clear that he is not keen on me playing the piano! 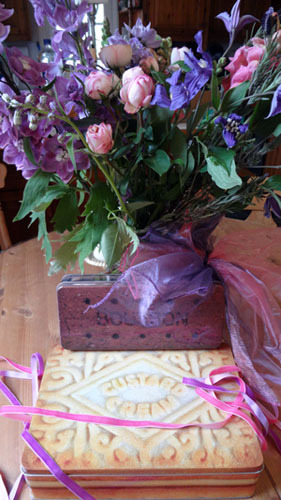 wonderful present from the NAS… biscuit tins in the shape of Jamie’s favourite, custard creams and bourbons! The first Jamie’s concert was launched at Muza Kawasaki Symphony Hall 10 years ago. Since then we have held 12 Jamie’s Concerts. They are always well attended and well received. We start with a brief lecture by Yoko Akashi, chairperson of the Autistic Society in Kawasaki, then the concert begins. Afterwards we have a tea party. For the concerts in Kawasaki, I fly to Japan with a suitcase full of Jamie’s favourite biscuits, custard cream and bourbons. The audience love them so much and they ask me if I buy them at Harrods Food Hall. In the UK, I have held 3 Jamie’s Concerts at various venues. 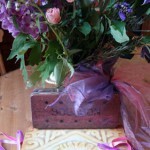 These are also popular and interest is growing rapidly. At Jamie’s concerts I get the chance to talk to primary carers first hand. The theme is a constant one: they tell me they used to go to concerts, but it became too difficult. They say that Jamie’s Concerts give them a chance to relax and to recharge, that they feel supported and understood. I can see the changes in them these days. The ladies in particular are getting more and more fashionable and they talk more openly about their children in a positive light. Ladies and Gentlemen, I am totally fascinated by Jamie. He interests me endlessly. At the same time, I am acutely aware of the challenges that caring for someone like Jamie present. Because autism is invisible, it is simply so hard to understand. Imagine being given this diagnosis 2 years or more after the celebration of a child’s birth. It is not hard to see why it takes a long time to come to terms with it all. Many of the mothers tell me they wonder if their child knew who their mother was. This has never been in doubt for me as the bond between Jamie and Janice was so deep that there could be no mistaking it. This means that Jamie’s Concerts give me a chance to tell the mothers, yes, I know for certain that your child knows who you are! In my view, autism is the toughest condition for families to deal with. It calls for fortitude, resilience and boundless patience. The lives of families like Jamie’s are tough, and relentless dedication and commitment are demanded at every turn. Fun and relaxation are rare commodities. Jamie’s Concerts give carers a chance to relax and enjoy a brief but vital respite. They have the opportunity meet with people in similar situations and to meet them without judgment or prejudice. This indirectly helps people with autism in just the same way that a calmer Janice meant a calmer Jamie. In the past this venture has been emotionally driven solely by me. Now, I have the pleasure to announce I have teamed up with academics at Guildhall School of Music and Drama. With the expertise of Professor John Sloboda, 4 of us will carry out research on Jamie’s Concerts. I am looking forward to the results with great interest. I often come across autistic people in public places. When the autistic person is upset and in distress I cannot help noticing the highly stressed expressions on the faces of their companions. I don’t need to offer help, but I just want to send a discreet message to say ‘I’m fine with this, I understand’. This wristband is for that purpose. It is a great honour for me to be appointed as a cultural Ambassador to the National Autistic Society. This privileged position will also enable me to spread the word about Jamie’s Concerts to a wider audience. I have known Jane Asher, President of the National Autistic Society, for many years. Jane has always encouraged me with Jamie’s Concerts behind the scenes and I am grateful for her unstinting support. I am hoping to work with the National Autistic Society for many years to come. Thank you for being here, Ladies and Gentlemen. With research and study, dedicated medical professionals are making admirable progress but we can help too in our own way. Rather than offering pity, we should disseminate information about the condition. It is vital that we enlighten and inform. Autistic people do not compromise – nor should we in our efforts to understand and to support them. I would like to thank Jamie for being such a significant figure in my life. I am privileged to know him and grateful for what he has taught me. He has given me another reason to play the piano by being ‘uniquely Jamie’. 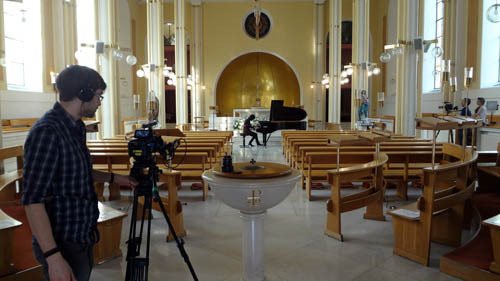 The video session continued till just before the doors opened on April 9.